I have so many vivid memories of my childhood home. Our family lived only one other place but that was LONG before I can remember. My mom and dad still live in that home today. Every time the kids and I go to visit I can recall playing football with the neighbor across the street. I can envision the forts we built in the back yard, and the garden where we found big huge worms on the tomatoes one year. I can see the dark brown panelling in the family room and recall throwing stuff down the laundry shoot. I remember standing at the top to the stairs giggling so hard while my dad and I played lions and tigers and I can still visualize the little space behind the couch my brother and I would crawl into when my dad can home from work. We would listen to him try to find us every night before he went up stairs to change out of his work clothes. Memories, oh sweet memories. Today most every house on that block has been sold to someone else and over the years my parents have gotten new furniture and remodeled most every part of the house but I still remember. I have had a monkey on my back, a dark cloud over my head, and a monster in my closet, for a long time now about something I thought I had taken care of ten years ago right before my oldest when to kindergarten. I thought the home we live in today would contain all of my children's childhood memories. Our home is not brand new. There are no granite counter tops and the kitchen cabinets need to be replaced. On a night like tonight when the temperature is estimated to drop to a frigid -17 degrees, I am thankful our 25 year old furnace is still keeping us warm. Our backyard has been used and loved over the years but is a mess. My children's friends and school are here. It is ours. It is the only place my kids know. However, life threw us a curve ball in the form of special needs. The journey has been beautiful but the degree of change it has brought has been unimaginable. This is not a complaint but more reality. It is was it is. Four years later Makenzie is thriving. She is healing. She is oh so loved. She is also getting bigger and still requires to be lifted and carried everywhere. Whether in my arms, in her walker, or in her wheelchair. Our home has stairs, lots and lots, of stairs. We have 2 full baths, both of which are......... up"stairs". There is also a step up on the main level cutting it in half. We have three steps at our front door, and more in our garage. They are everywhere. I spent some time talking to my uncle about some of my ideas for modifying this house. Each idea was shot down. At the end of our conversation his final suggestion and only one that made any sense was for us to move. To pack up all of our memories and start new. Part of me feels sad just thinking about this. The other part of me is excited. There are some really good memories here but there are some not so good ones as well. I am excited to think that one day.... hopefully sooner then later.....the monster in my closet will go live under a rock in the Alps, the dark cloud will move back to the rain forest, and the monkey will go back to the zoo. I will be able to finally breath a sigh of relief knowing that Makenzie will have what she needs. I will be back on course to owning my house one day, and the boys will still be young enough to create childhood memories both they and I will remember forever. Please pray that God will open the doors needed and that I would hear His leading! I still can't get over this picture. I just love the expression on Makenzie's face! It will be a memory that is etched into my heart forever!! This may not be the best picture ever taken. It may not be tack sharp. There may be a bit too much noise because my ISO was set too high and my camera is far from professional quality. However, I am pretty sure there are not many people out of the 400 plus pictures that were entered into today's photo of the week contest at iheartfaces who will remember the story behind their picture like I will this one!! What a day that was!!! I am so very proud of my girl!! Today my niece and nephew got baptised at our church. Baptisms are always such a wonderful event. In this case my family, friends, and our church body wrapped their arms around my brother and his wife as a promise to help Little Landen and Emma get to know Jesus. What a precious moment! I watch my brother with his two little angels and am so proud of the daddy that he is. The glow he has is stunning. Six weeks into his children's life I can truly say he is and will continue to be a model dad and husband! I looked at the four of them up on that stage today and saw such a strong God fearing family. I can't wait to watch both of those beautiful babies grow up! After church we heading over for a celebration at my parents house. Tons of food, laughter, and a bit too much baby passing went on! I however restrained myself from holding any babies. It was hard, really hard but the flu they do not need. I am not sick but I am sure living in the same house as two sickies makes me a carrier of germs. I also go to see my grandparents for the first time since their accident last year. I was so relieved to find them in good health and although a bit slower, they are the same wonderful grandparents I have love for my whole life! My grandpa is still having trouble with one of his knees and it is causing him some pain. He will most likely need to have the whole knee replaced but before that can happen it needs to heal further from a previous surgery! I ask you to please pray for healing!!! I had such a good time seeing people I have not seen in years! Life is too busy! Makenzie walked around my moms house like she owned it! Every so often she would bump into someone and smile. She so enjoyed being part of the action and was not intimidated by any of it!!! After everyone had gone home we sat down around the dinning room table and played cards. It was a ton of fun after we all agreed on the rules of the game. It was a really wonderful day! I am so happy for my brother and his wife. I love that God has finally given then the family they have wanted for so long! It was a long journey for them to get to this day and they deserve every ounce of happiness that has come from these two little lives!!! Or the not so sick any more soul! The boys woke up feeling much better this morning! No one else is showing any signs of becoming sick! Praise God!!! I don't care for the smell of bleach at all, but today it was a welcome scent as it signified all of the germs being washed away! GONE! For lunch my not so sick boys, who have already begun fighting again, asked for Chicken Noddle Soup for lunch. I guess it also soothes the not very sick soul as well! I have also been plugging away at the laundry and with any luck and with no major interruptions it may just get done!!! Makenzie is hanging out in her walker and I am thinking we may head to the park again. Sixty degrees in January......... We should be wearing hats, coats, and boots this time of year, but instead we will through on a lite jacket and head out to enjoy some wonderful fresh air! Now that is better then the stench of bleach anyday! The Flu, the A strain to be exact. We have it over here. I think it really stinks because we had a ton planned for this weekend. My grandparents, who were in the car accident that I wrote about here and here, got into town yesterday. I have not seen them for about 2 years and tonight we were supposed to play cards together. Tomorrow we were going to do a big breakfast, and on Sunday my niece and nephew are getting baptized with a big party after wards. Here I am at home with sick kids not knowing when or if I will even get to see my family on this big weekend. I guess that is just how life works. Now to count my blessings, we caught it early and Tamaflu should help kick it much faster. The pediatrician is treating Makenzie with a prophylactic dose just in case. At the first sign of illness J and I will be heading to the pharmacy for our $70.00 box of medicine! So today I played with pictures. I am not a pro by any means but it is something I like to do and can do from the comfort of my home. I have always loved pictures and could kick my self sometimes for not taking the time to learn how to take better pictures a long, long time ago. I spent a while looking a pictures today. Getting ideas and checking out other peoples styles. The Fix it Friday post and linkey was really fun because I got to look at the exact same picture and all of the many ways to edit that one picture! I read a lot about actions and even figured out how to unzip a file. Moving up in the world!!! So I had to try it out! Makenzie thought standing on her head in therapy yesterday was great fun! She didn't really want to do much for her OT so they did some body awareness and circulation stuff inspired by yoga! This was one of my most favorite pictures from the park yesterday. I find it amazing when you boost the color and sharpen a bit how much better the picture looks! This is very addicting. It feels good though to finally LIKE to do something that is realistic for once in almost 4 years! So even though I got absolutely nothing done today I sure had fun. Please say an extra prayer tonight for my sick family. Pray no one else catches this nasty flu bug and that my two sick boys wake up in the morning feeling better!!! This post really has nothing to do with my life other then the fact I am really enjoying learning the art of editing pictures. So today after I took two of my kids to the doctor to find out they both had the flu I set them up with a movie and sat down to tackle Fix it Friday at iheartfaces. I had a lot of fun playing with this image in PS elements. I opened it in RAW to adjust the Exposure, Blacks, and, Clarity. I cropped the image into a 5x7. Then I opened the image in PS elements and sharpened some of the picture using the unsharp mask and a layer mask. There are a few spots that are to sharp but nothing is ever perfect, right? After I flattened the image I used the clone stamp tool to lessen the dark circles underneath the eyes. There ya have it! There comes a time when I need to decompress. Even if just for a few moments I need to go to a place were laundry, dishes, therapy, asymmetrical hips, a sick 13 year old, appointments, and the need to replace our 25 year old furnace, don't exist! Where better to do that on a sunny winter day, then the park!!!! The second I put Makenzie in the car with her walker and told her we were going to go to the park she got so excited. The boy were armed with skateboards and Rollerblades. When we got there I pulled her walker out of the the car Makenzie started kicking and laughing. It has been so many months since it has been nice enough to head to the park so her understanding of the event had me utterly amazed! The park that we went to happened to be a school so there were mobiles with a nice smooth ramp for Makenzie to try out! She DID it!! Her steps were so big and so strong! Kaleb stood at the top cheering her on while I hung out behind making sure she didn't go flying backwards! Going down the ramp was even more fun and the giggling that ensued was absolutely priceless!! As we made our way around to the playground the steps got faster and faster. The boys stood on the play structure calling for their sister to come and play! She made it to the edge of the gravel begging with all her might to get out and play. So play we did!!! I am pretty sure going down the slide with her brother was Makenzie's favorite. It took some doing and a little help to get her onto the slide but we got er done and it was well worth all the effort! We played on the swings for a while and then I put her back into the walker and she watched her brothers take flying leaps of of the swings before we had to head back to the car. By the end of our time Makenzie was standing flat on both of her feet straight up in her walker. If you notice in the above picture the chest support in no where near her body!! Go Kenzie! And of course she got stuck a few times in the weirdest places! Oh boy, me oh my, I think I am in trouble!!! I should have been at home doing something, anything at all, but instead I was at the park with three of my most favorite people. It was a priceless hour. So simple but this afternoon will not soon be forgotten!! My other favorite young man had to stay home because sick he is. Which will most likely land us in the doctors office tomorrow. I have a sneaking suspicion he has the flu but we are crossing our fingers that it is not. Please pray for health as we have a busy weekend ahead of us! The People In My Life Rock!!! I have been sitting here trying to think of something more creative to say then.... Makenzie had a great day.... but to sum it all up that is really the beginning, middle, and end. So I gave up. Makenzie had a great day!!!!! She had therapy at home and then we went to the clinic for more therapy. Makenzie got a massage which loosened her shoulders up a ton, she worked on tall kneel, all fours, tummy time, and pushing a ball while standing. She giggled, smiled, and played. Several years ago when Makenzie started having therapy at home we stopped going to all but one of the therapists at the hospital. Over the years as life has gotten busy, I have often contemplated whether or not to make the trip out there every week. Despite school starting and everything going on with the boys we have managed to keep making it there.I love Ms Christa too much and she is so good with Makenzie, we just make the time. Today at therapy Makenzie showed us some wonderful new things she could do but the most fun one was how Makenzie is reacting to the people in her life. Makenzie is starting to recognize people outside of our family when they are not in her presence. Every night while I am putting Makenzie to bed we talk about what we did that day. It is so cute to watch because when we talk about the people we saw and what we did with them, she gets so excited. Today at lunch I told Makenzie we were going to go play with Christa and she lit up with a huge smile from ear to ear. When we pulled up to the clinic she was all smiles and then when Christa came out to get us she smiled, started kicking, extending, and laughing! I love it and I am pretty sure Christa does too! There has been so much healing. I am so very grateful for all of the Christa's God has put in Makenzie's life! We are so blessed! Complacency.... Or More Like the Lack Of! For the last 3 years I have had a very happy, complacent little girl who by really no other choice just went with the flow. Slowly but surly that is changing. Over the last year Makenzie developed a knack for temper tantrums at bed time complete with breath holding, blue lips and all. Then she started giving the pouty lip when the boys walked out of the room with a full blown cry feast if they did not come back. This led to sneaking out the front door for school and play time with friends. A few months ago Makenzie started fussing if I tried to sit at the computer or on the couch when she wanted to do something else. It has been wonderful to watch the healing. It has been almost 4 years since her accident. Watching Makenzie continue to heal and grow is breath taking! But wait....... I am not finished telling you about my girl who is, not oh so complacent any more. Over the last 2 weeks.... well 1 week, 6 days, and 6 hours..... since Makenzie's therapist let us borrow the new walker, I have watched her bloom, change, grow, and heal at warp speed. My girl wants to go. Makenzie knows now that she can, and sitting still is not an option anymore. 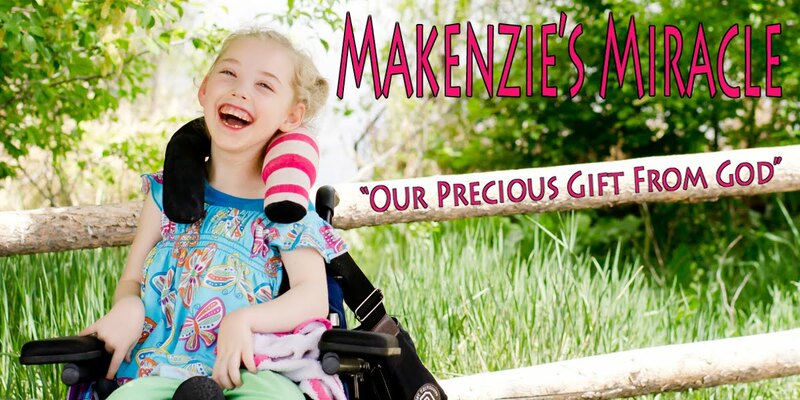 Makenzie has gotten much better with turning and now that her legs are not so sore she is pushing much better. This has given her some wonderful forward progress with turning the walker and she has even managed to get her self unstuck several times. Most of the time though mommy has to come to the rescue and turn her around. For the last 2 weeks when she has become "stuck" Makenzie has stood in that place waiting very quietly and patiently for mommy to come and move her...... until today. Today Makenzie decided to find her voice, squawking, squealing, and whining the second she could not move. For the first half of the day I smiled and thought it was the cutest most wonderful thing ever. By lunch I realized this new behaviour was going to get old really quickly. Makenzie is moving fast and today the second I got my hands in the dish water, headed to the mailbox, started to switch out the laundry or heaven forbid attempted to put it any of it away, I had to turn around to turn Makenzie around. Don't get me wrong I am not complaining AT ALL and I will continue to do 180 degree turns until Makenzie figures out how to do them all by herself, but let me tell you.... I didn't get much done today! I LOVE IT! We did manage to make it on some errands and there was not wheelchair in site. Just my little girl, on her own two feet, collecting smiles from all who witnessed her miracle. I am so dang proud. I am so excited, I think there are permanent butterflies in my stomach. I am so thankful to a God who is healing my daughter in His own perfect time. Tonight I am shouting from the cyber space roof top, no matter if this healing is $10,000 stem cells, or $2000 ABM, or nothing at all ,..... TO GOD BE THE GLORY! This afternoon I ran across IHeatFaces weekly photo challenge titled "Innocent Wonder" and I thought of this picture. My son was sitting on the edge of a planter box watching all of the big rambunctious middle school kids who were milling around waiting to get on the buses heading to camp. When I look into those big brown eyes I can see the wheels turning with wonder over what was unfolding before him! Two more years buddy before you have to joins the masses!! I promise it really is a lot of fun! Come to think of it, I may really like the word Profound after all. They had a profound amount of fun getting profoundly messy! What a great weekend! If you didn't notice in the above pictures, we have found another use for Makenzie's Water Way Babies ring. It doubles as a really great head support while she is in her walker! A big thanks to Makenzie's PT for suggesting that one. We had a a really great day. Makenzie did wonderful in PT. She had a whole lot of fun rolling her huge therapy ball with her own hands! She was so proud and excited! Makenzie is walking great in her walker again. The soreness she has had for the last week or so seems to have all but disappeared over the last 2 days! Makenzie is back to taking big steps, pushing much harder, and covering more ground a lot quicker . What a relief! She is also getting better at turning but still gets stuck quite a bit! Ok I think I am done rambling now. I have been so tired and had a headache for a good part of today. I am going to get Makenzie's stuff ready and head to bed in hopes that I will feel better in the morning!